Vedic knowledge is carefully passed down from guru to disciple in spiritual lineages called sampradayas. India’s sampradayas carefully protect their traditions of deep spirituality, since any knowledge which is not received from an authorized sampradaya lacks real spiritual benefit. The Hare Krishna movement strictly adheres to the sampradaya system. 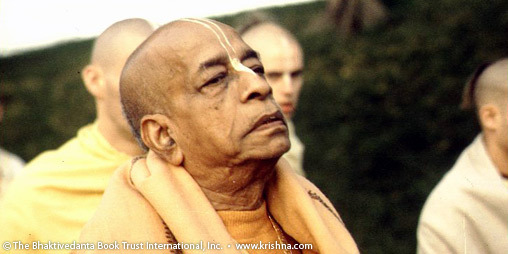 Srila Prabhupada, the movement’s founder, represents the Brahma-Madhva-Gaudiya sampradaya, which began with Lord Krishna and includes His most recent descent as Chaitanya Mahaprabhu. The lineage is known as the "Brahma sampradaya" because at the beginning of creation Lord Krishna Himself instructed Brahma—the first created being, and architect of the universe. The line later became known as the "Brahma-Madhva sampradaya" because of the prominent teacher Madhvacharya (A.D. 1238-1319). Still later, the line became known as the Brahma-Madhva-Gaudiya sampradaya, after the line was joined by Sri Chaitanya (1486-1534), who appeared in the region of Gauda (Bengal) and gave the tradition new life.